At Palola Dental, we make it our goal to provide excellence in family dentistry and cosmetic dentistry services, such as teeth whitening, same-day crowns, and dental implants, from our fun and family-friendly office. Our commitment to high-quality dentistry for those in and around Mililani and Waipahu runs throughout our practice, but it all starts from the top with our wonderful dentist. We’d like to introduce you to Dr. Jaclyn M. Palola! Dr. Palola was born and raised in Ewa. 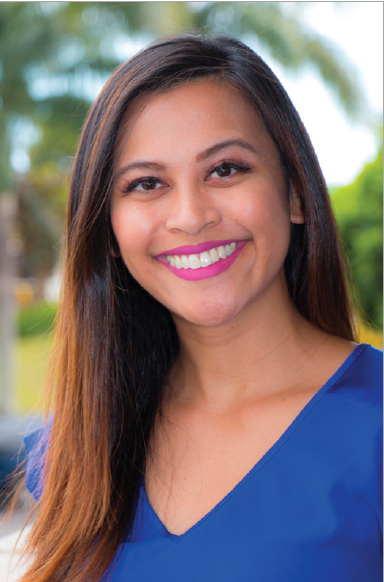 She graduated from Hanalani High School in Mililani as the class valedictorian. She moved on to the University of Hawaii at Manoa where she received her Bachelor of Science degree in Mathematics. While there, she was also honored as a Board of Regents Scholar. Dr. Palola loves getting lost in a good book, watching sci-fi shows, attending barre class, and attempting karaoke in her (increasingly shrinking) spare time. While her schedule can be hectic, she wouldn’t have it any other way; she truly enjoys caring for patients and giving them healthy smiles that they can show off with pride. If you’re interested in any of our family or cosmetic dentistry procedures, such as same-day crowns, teeth whitening, or dental implants, please feel free to give us a call at (808) 678-3000. If you have any questions, comments, or concerns, we encourage you to contact us. We hope to hear from you soon and help give you a smile that you can show off with pride!